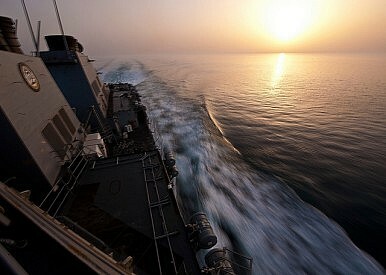 The guided-missile destroyer USS Porter (DDG 78) transits the Strait of Hormuz. What international law really says about the recent exchanges in the strategic choke point. In his article “Overreaction in the Strait of Hormuz,” Mark Valencia compares prevailing Iranian and U.S. views on freedom of navigation as embodied by customary international law and the United Nations Convention on the Law of the Sea (UNCLOS) in light of recent instances of Iranian aggression towards merchant shipping. Indeed, Dr. Valencia correctly states that neither the United States nor Iran are among the 164 states that are party to UNCLOS, and notes that Iran “has signaled its support of the Convention by signing it.” Dr. Valencia does not mention that every United States president, from both parties, has expressed support for joining UNCLOS for over the past two decades. In addition to this oversight, three other key issues in Dr. Valencia’s article merit clarification. I. Transit Passage Was Part of the Bargain Dr. Valencia correctly states “there was no ‘transit passage regime’ before it was stipulated and detailed in the Convention,” thus suggesting there is no customary right to transiting international straits outside the regime of innocent passage. At its core, UNCLOS was intended to preserve freedom of the seas. Transit passage emerged as a compromise between strait bordering nations (who sought to secure coastal rights) and maritime states (who sought to secure freedom of transit through internationally recognized straits). As part of this bargain, UNCLOS extended territorial waters from three nautical miles to twelve nautical miles. The Strait of Hormuz is only twenty-one nautical miles wide at its narrowest point, and, therefore, fully within Omani and Iranian territorial waters. But prior to the extension of the territorial seas, a high seas corridor existed for centuries where ships could transit without entering Omani or Iranian territorial waters. UNCLOS, or any other international agreement, should not be viewed to restrict this right. Strait bordering nations could either acquiesce to the transit passage regime or retain three nautical mile territorial seas, as Japan has done in some instances. What is not an option is restricting freedom of navigation for any vessel – whether the flag state of the vessel is a party to UNCLOS or not. Dr. Valencia states: “At some point in their passage into and through the Persian Gulf, U.S. warships must pass through Iranian claimed territorial seas.” This is not true. The inbound traffic separation scheme often used by U.S. warships is wholly within internationally recognized (and even Iranian-recognized) Omani territorial waters. U.S. warships need not enter Iranian internationally recognized or excessive claims in order to transit the strait. Nevertheless, while not required for transit, customary international and UNCLOS provides vessels the right to transit shoreline-to-shoreline while engaged in transit passage. So if U.S. warships wanted to transit within Iranian territorial waters, they lawfully could. Dr. Valencia asserts that when USS Whidbey Island (LSD 41) fired a warning shot “at an approaching small Iranian boat” it violated UNCLOS rules on innocent passage. Indeed, innocent passage prohibits transiting vessels from engaging in “any exercise or practice with weapons of any kind” and from using any threat or use of force against the sovereignty, territorial integrity, or political independence of the coastal nation. Similarly, ships and aircraft engaged in transit passage must refrain from any threat or use of force against States bordering the strait. But Dr. Valencia does not acknowledge that these “small Iranian boats” are often armed with .50 caliber machine guns and travel in packs throughout the Arabian Gulf, using “swarm tactics” to harass U.S. warships and merchant shipping. And Whidbey Island’s firing of a warning shot likely did not fall into the rubric of weapons practice or exercise, but instead constituted self-defense. From Hugo Grotius to modern legal scholars, self-defense has been long-recognized in international law as a right of states under international law. The restrictions in UNCLOS do not limit a warship’s inherent right and obligation to self-defense. In 1837, the customary international law of anticipatory self-defense emerged during the Upper Canada Rebellion, when U.S. Secretary of State, Daniel Webster, first articulated the Caroline test, establishing the principles of necessity and proportionality. Under these principles, the use of force is justified in the face of an imminent threat so long as the response is proportionate to the threat. Thus, the firing of a warning shot (which by its nature is designed to deter rather than destroy) in the face of a perceived threat, is merely the exercise of a basic right in international law. Perhaps Dr. Valencia’s conclusion is correct: The United States and Iran should establish “an incident at sea agreement” in order to reduce the risk of escalation. Although perhaps not the author’s intent, Dr. Valencia’s article also underscores that, as a party to UNCLOS, the United States will be in a better legal position to counter the efforts of coastal nations to restrict freedom of the seas. While customary international law provides a recognized legal basis for U.S. military and commercial maritime activity, the formal mechanisms of UNCLOS would bring about greater legal certainty to U.S. positions on freedom of navigation and, thus, dampen the critiques to U.S. positions that Dr. Valencia poses. Matthew W. Ivey is a Lieutenant Commander in the United States Navy, and is currently assigned as the senior attorney to Carl Vinson Strike Group. Carl Vinson Strike Group is returning from a deployment to the Arabian Gulf, during which strike group ships and aircraft conducted multiple transits through the Strait of Hormuz. This Article was written in the author’s personal capacity and does not necessarily represent the views of the Department of Defense, the United States Navy, or any of its components. Given very different positions and provocative actions, Iran and the U.S. need a buffer to prevent escalation.